Governor Cuomo signs legislation at World Trade Center 7 clearing the path for the creation of an AirTrain link between LaGuardia Airport and Willets Point, Queens. LaGuardia Airport is the only major airport on the East Coast without rail service. Governor Cuomo signed legislation to begin mapping out a route for a train from major transit hubs in midtown Manhattan to LaGuardia Airport. 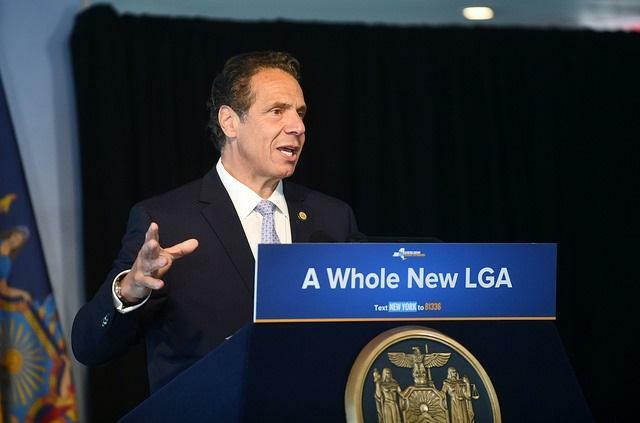 Cuomo says the $1.5 billion project, known as the LaGuardia AirTrain, is an effort to make up for years of neglect in the state’s, and the nation’s, infrastructure. The project will by 2022 offer 30-minute rides from major transit hubs in midtown Manhattan, including Grand Central Station and the new Moynihan Train Hall, which is currently being built adjacent to Penn Station. It will also connect to the Long Island Rail Road station in Queens at Willets Point, near Citi Field, home of the New York Mets. Without the train, it’s estimated that traffic delays, which are already 30 percent longer than five years ago, will further increase in the coming decades. The legislation takes the first steps toward planning the train’s route from Manhattan to the Queens airport. It will allow a number of potential routes to be considered during the FAA’s upcoming environmental review of the project. And it will take into consideration the concerns of residents who might be impacted. The governor says the AirTrain route will not involve any eminent domain “takings” of private land. Cuomo has touted his focus on building infrastructure, including a replacement to the Thruway’s Tappan Zee Bridge with a new span named after his father, Mario Cuomo, the late former governor, and upgrades to several upstate airports in Elmira, Rochester, Syracuse, Plattsburgh and other cities. “It’s not just downstate,” Cuomo said. But Cuomo’s Democratic primary challenger, Cynthia Nixon, and others have criticized him for what they say is neglect of the New York subway system, that’s led to record delays. Cuomo says the Metropolitan Transportation Authority, which oversees the subways, has embarked on a plan to replace 100-year-old signal and switching stations. Cuomo appoints several board members, as well as the MTA chair. The plan includes an $800 million emergency rescue fund. But the governor says his predecessors are equally culpable for the deterioration, saying the subway has not been maintained properly for 70 years.